One of the most useful power tools for keeping up the appearance of your yard is a weed trimmer. Also referred to as a weed eater or string trimmer, this garden tool’s versatility and ability to get into small places where a lawn mower can not reach makes it a must have for anyone who wants their yard looking its best. A string trimmer operates by spinning a nylon string at high speeds. When in operation, you must take safety precautions as you can easily cut yourself if your leg or foot should come in contact with the rapidly rotating nylon string. Most string trimmers come with a guard to protect you from flying debris, but sometimes stray rocks or small branches are launched in the area you are working. Be sure children don’t get too close while you are operating the unit. 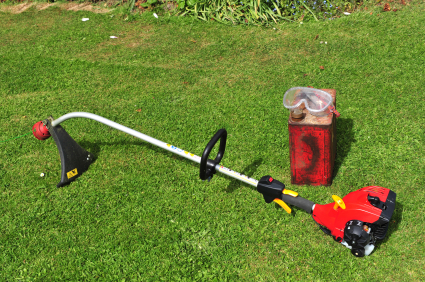 There are three basic types of weed trimmerss that you can choose to use – gas powered, electric and battery powered. There are advantages and disadvantages to each. Before you go to your local home improvement store and buy a weed trimmer, you should know a bit about each type. For quickly cutting through tall grass, a gasoline powered weed trimmer is the best choice. It has a more powerful motor and consequently, greater cutting ability. Gasoline is stored in a small tank near the handle and the machine is engaged by pulling on a short cord. If properly primed and well maintained, getting the unit going is a simple matter of a firm tug or two on the starter cord. If you do not properly prime your string trimmer or it has been sitting idle over the winter, you may have difficulty starting it. It is really no different than trying to start a lawn mower. The advantage of a gas powered weed trimmer lies in its power, ability to cut large areas quickly and its portability. It is able to cut around bushes, up against fences and around most obstacles. The tank provides plenty of fuel to allow you to work for hours without having to stop and refuel. On the negative side, gasoline powered weed trimmers are quite noisy. They can give off irritating fumes and they are heavier and somewhat tiring to use for long periods of time. They sometimes are difficult to start. Gas powered versions of string trimmers also tend to cost quite a bit more than their electric or battery powered counterparts. This type of weed trimmer is preferred by many homeowners. As long as you have electric power, this model will start up immediately with the press of a button. It is lightweight, but still produces plenty of power to get the job done. Most usually have a feature where you can rotate the head and use it as an edger. Depending on the model, you may be limited in the size and strength of nylon cutting string which can lead to more breakage and frequent replacement. Also, you are limited by the length of the electric cord. If you have a good sized yard you may need 100 or more feet of extension cord to be able to get to all areas that need trimming. In addition, a 100 foot cord is hard to drag around, it can get snagged around a tree and it can become all twisted and tangled up. Technology has come a long way in the past few years when it comes to battery powered weed trimmers. The early battery powered models were weak and the batteries lost their charge in only a few minutes. Today, you can get decent performance for about an hour before having to replace or recharge the battery. The battery powered weed trimmer has the advantages of portability and instant start-up at the push of a button. It is very quiet to operate and is good for keeping a small yard neat and tidy. What Can a Weed Trimmer Do? Besides the standard cutting of unruly grass and weeds, there are a number of other applications possible. You can get rid of thorny vines by chopping them up into small pieces. Trimming small shrubs and bushes is a snap with a good weed trimmer. Turn the head to a 90 degree angle and it becomes a very competent edger for trimming along cement paths and driveways. Mulch leaves by holding it flat against the ground and keeping it there for a few seconds. Who Are Some of the Companies That Make Weed Trimmers? There are probably fifty or more companies that build one or more versions of a string trimmer. Some small independent companies only build string trimmers (you can often see their infomercials on tv) while other large companies have them as part of a wide line of tools and power equipment. Some of the national brands that are popular with consumers include Black & Decker, Troy Built and Husqvarna. Where Can You Buy a Weed Trimmer? The answer is pretty much anywhere garden tools are sold. Home Improvement centers like Home Depot or Lowe’s offer nice selections of all 3 types of string trimmers. Walmart, Kmart and other large box retailers sell them. Hardware stores and Garden shops often carry some models. You can certainly order a string trimmer online. What Does a Weed Trimmer Cost? As a general rule, gasoline trimmers are the most expensive. Electric and battery powered units are lower priced then gasoline units and comparably priced with each other. Starting prices for an electric string trimmer can be less than $50.00 and can range up a bit above $100.00. Battery operated units start at about $75.00 and go up from there. Gasoline models usually cost over $100.00 and can easily exceed $200.00. Consider the size of your yard, how thick and tall your grass grows and your budget before deciding on the weed trimmer that is best for you. Hello. Tonight on a tv commercial I saw a weed eating tool and I forgot the name of it. I’m not sure if only the head is sold or if it’s the entire (shaft + head) weed-whacking tool. Anyway, this thing doesn’t break when it hits a chainlink fence. ‘And it won’t damage the fence, either. Do you sell it? Do you know the name of the machine? I’ve been wanting to try the new battery powered ones. Would you recommend them for commercial use?